Do you have fiber-related equipment you want to sell? Description of the item(s) you are selling, in the final format you want posted. Separate photos (.jpg format) if desired. We do not post phone numbers, or street addresses due to security issues, unless requested. ​All ads will remain posted for 3 months, unless requested to be extended. Please notify us when your item has sold. Be aware of scam emails! Unfortunately, there are a lot of shady characters out there trying to separate you from your money. This is not unique to our website. It happens on all websites. We want you to be successful with your transaction, so if you are a seller, please read the pdf (click here) or word doc.​​ (click here) for warning signs before you sell your equipment. ​Disclaimer:​ Triangle Weavers is not involved in any part of the transaction between the buyer and seller, nor do we make any claims or guarantees as to the accuracy, quality, or condition of the items advertised. ​shuttles, pickup sticks,accessories, bag and two books. Retails for over $440. Everything is like new, in great order, I just don’t have time to devote to weaving. Can meet in Farmville, Wilson or Greenville. The first is a 24-inch, 8-harness, 10-treadle with bench, and extras. We are asking $700 negotiable.SOLD!!! These looms have been in temperature and humidity-controlled environment. While they are used, they are in as close to new condition as possible. Many extra accessories are also available. We also have several hundreds of cones, skeins, balls of wool. Everything from rug wool to mohair. Very wide selection of colors. All the wools have been in heated /air-conditioned environment. Warp board/ frame loom and lots of other weaving stuff.Prices negotiable, the more you buy the better the price. Contact Debbie Tapp at WTappIIIDDS@aol.com if you are interested and would like to arrange a time for examination. The New Penelope II Leclerc Tapestry Loom + 4 rigid heddles for changing sheds, + the book "I Weave, You Weave". $300. for all. Sad to part with Penelope, I've never used her. Brand new condition! An excellent loom for beginners and hobbyists who want to learn tapestry technique. 23¾"" wide tapestry loom, made of a solid frame with 2 beams, ratchets and dogs which allow you to put on quite a long warp. The loom has 2 rigid heddles which are along the top, for quick shed changing action. ***Included: 4 separate reeds: 6,8,10 and 12 dent.*** . These usually sell for 30$ each. The loom folds so that it can easily be carried anywhere. It is solidly built in Canadian maple like all Leclerc looms. 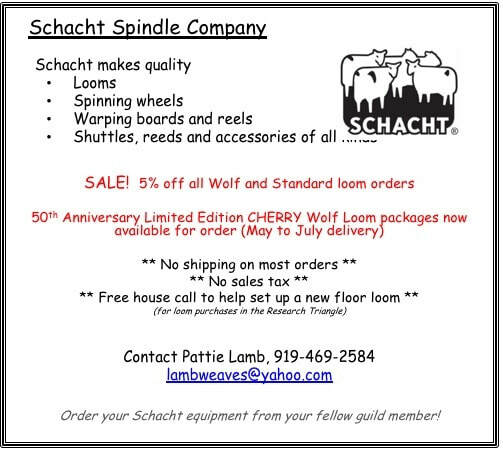 ​Spinning Wheels, Clemes Wool Carders and Roving for Sale! Both wheels are in very good condition. Mid 1800’s. They are functional 22” wheels and have a restored flyer/whorl/bobbin/ and footman treadle. One wheel comes complete with a rare original distaff. $200 each or $300 for both. 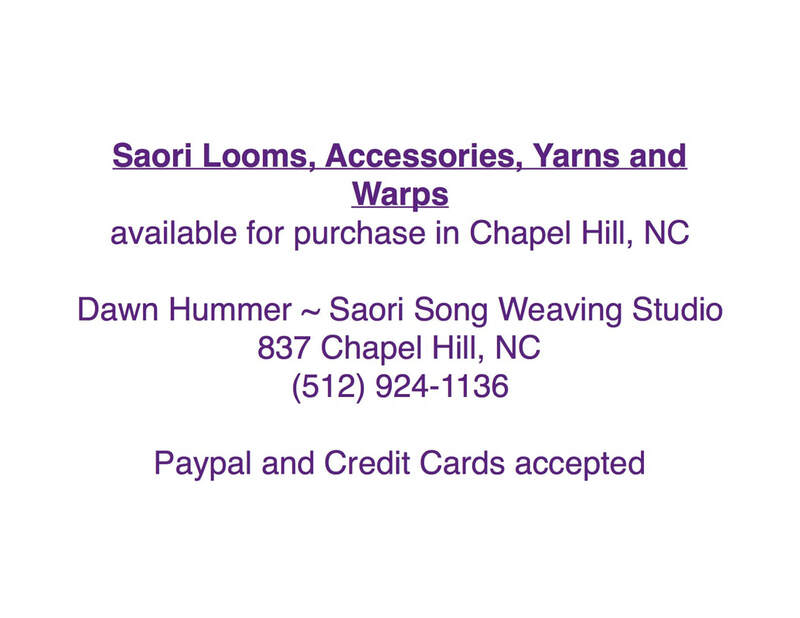 Loom is located in Cary. Help with transport in the Triangle area may be possible. Sale is for the complete package. My mother passed away and I am cleaning out her “loom room”. I am selling individual books/magazines, but if you purchase 5 or more books, or 10 or more magazines, then I will discount the price by 50% (not including shipping)! I have almost all issues of Handwoven from 1979 through 2012 as well as the comprehensive index that is a great resource when searching by author or topic (Handwoven: 21 year index). If someone buys all 146 issues then I will include the index for free. I want these materials to get used, but I also want to minimize the time and number of trips to the post office. So, please send me an email with any questions. I am happy to provide pictures. My mother lived in Denver, was active in the guild, and attended many workshops. So, I also have several binders of patterns and instructions. 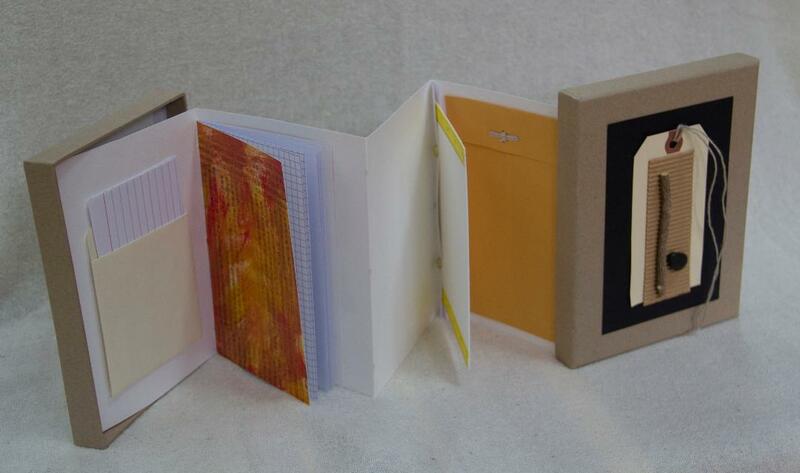 Each binder is $5.00 or 2 for $8.00, 3 for $11.00, 4 for $13.00, all 5 for $15.00. Please let me know if you are interested and I will send more details. I will be shipping from 28411 and can mail the books and magazines via USPS Priority Flat Rate (which includes insurance) or the cheaper Media Mail (without insurance). When responding, please send me your shipping preference and zip code and I will compute the shipping cost. Paypal only please. To view the complete list, click here for the pdf file or click here for the word doc. file. My uncle purchased the loom in Sweden in 1971 and had it shipped back to the US. 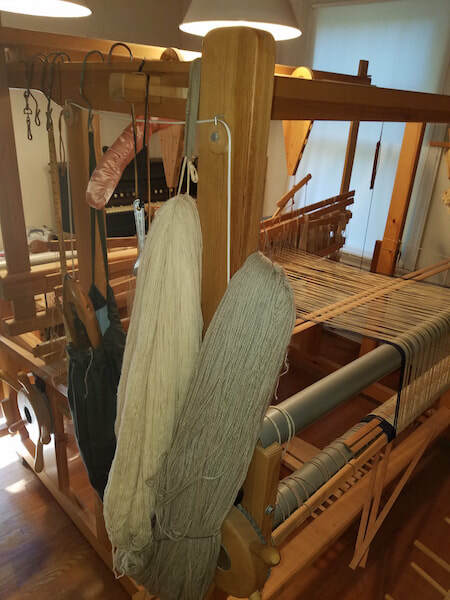 The reed bar is 64", the loom itself is 74" wide, 62" deep and 69" in height. I have extensive accessories for it. This is a 4-harness model with room to add up to 6 more. 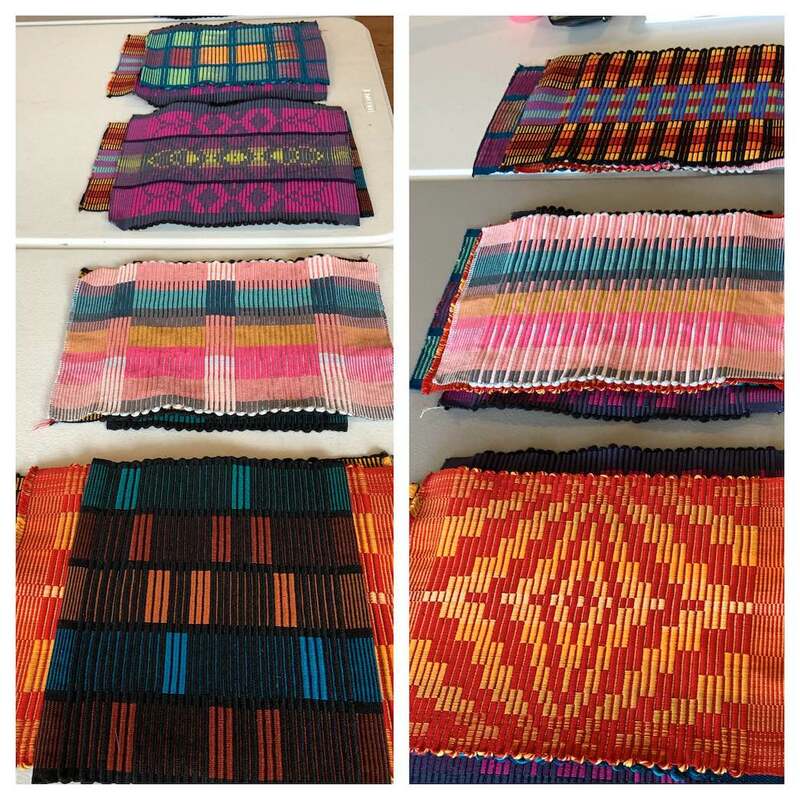 It has a 48” weaving width. Stored inside. Made in 1979, same style made today. Asking $1200.00 OBO. Cash sale, local pickup. Clayton NC area. ​After many years of weaving I am about to sell one of my looms. We are moving to a retirement community and must downsize so the Louet Megado has to go to a different home. This beautiful loom is computerized with 16 harnesses, 44 inches wide, and has a wonderful tension and brake system. It is a real joy to weave on this loom. Included is a bench, a built in raddle, a laptop computer to run the loom (used computer) and an assortment of shuttles. See photos below. I have spoken with the President of Louet NA and he suggested a price of $12,000 but I am asking $8,000. I will help the new owner move and set up the loom, if local. The president of Louet NA has offered to help, or send one of his associates, with any problems the buyer may have that I may not be able to help with such as assembly or getting the loom up and running. I may be reached at raross216@gmail.com in Chapel Hill, NC. Don’t hesitate to e-mail me with questions about the loom. 12 dent reed as well as numerous super hooks and original hooks. It also has the original crank which are hard to find nowadays. 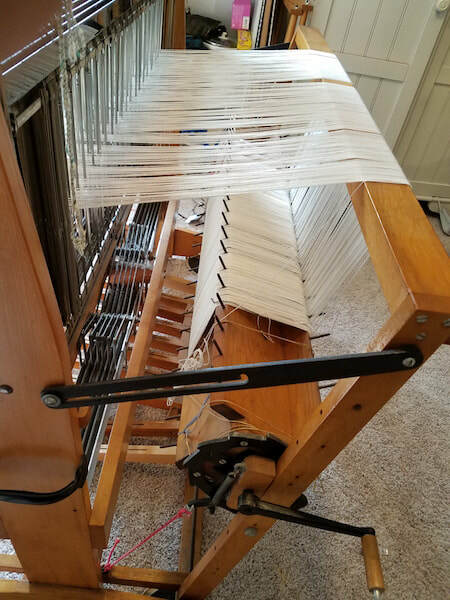 Herald Loom for Sale: Price reduced to $1700! Herald 8-shaft 10-treddle floor loom, 46" wide. The Herald is in excellent condition with aprons front and back, a whole new tie-up system, and colour-coded shafts and treadles. I'm just too short for it. Located in Chapel Hill and can deliver anywhere in the Triangle. 3 full skeins and many partial skeins. $35 for the whole lot. Tools of the Trade loom - 8 harness (shaft), 10 treadle, 45 in. SOLD!! All parts and accessories - perfect condition. 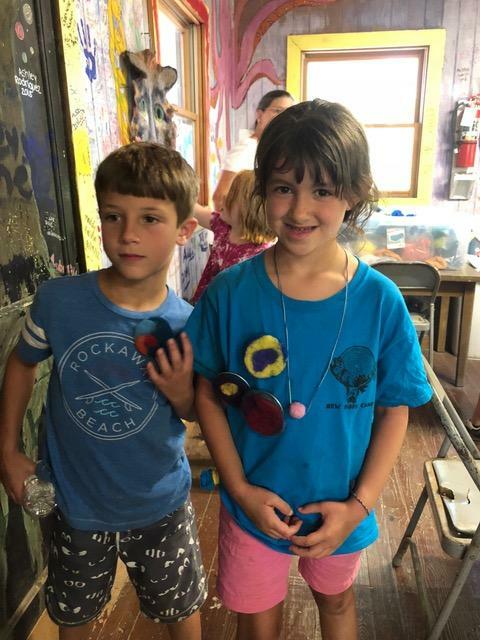 They can be seen and picked up Twin Birch & Teasel fiber shop where they are being stored. Refurbished electric bobbin winder with all new parts, including motor and foot pedal. Dual speed control, winds all size and types of bobbins. Local pickup. Will not ship. Cash only. ​Please leave a message on answering machine and I'll return your call. 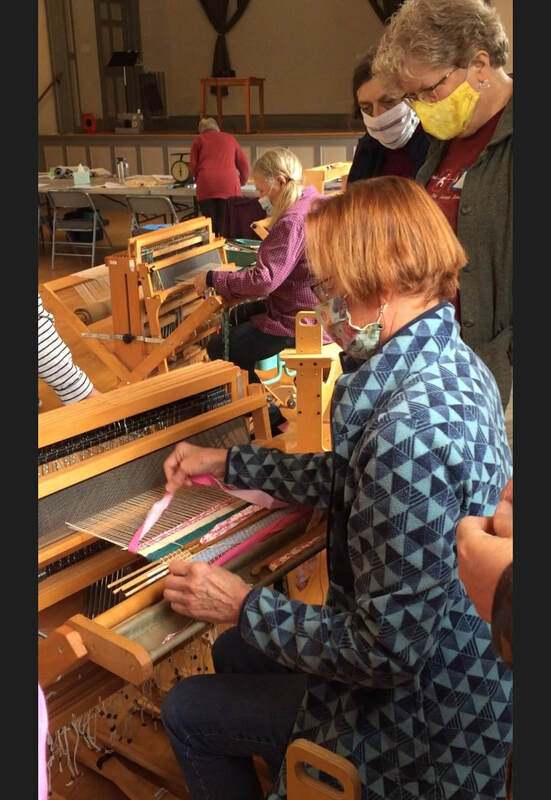 Weaving with an end feed shuttle can transform your weaving experience and your selvedges! 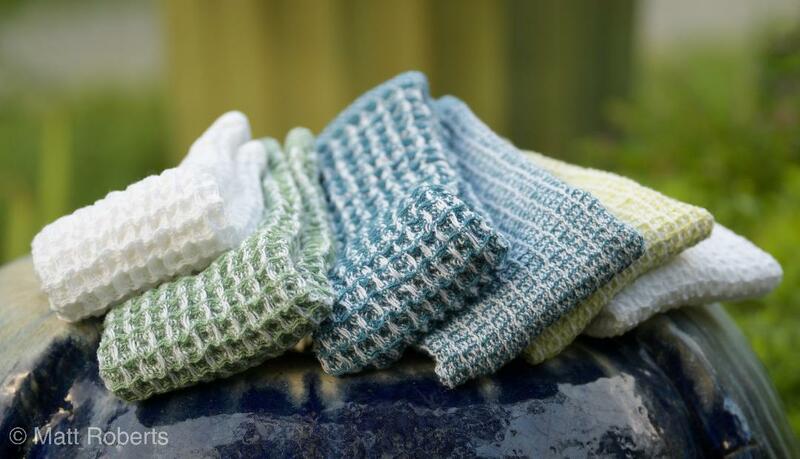 End feeds such as this are great for using smooth yarns like pearl cottons, tencel, and silks. 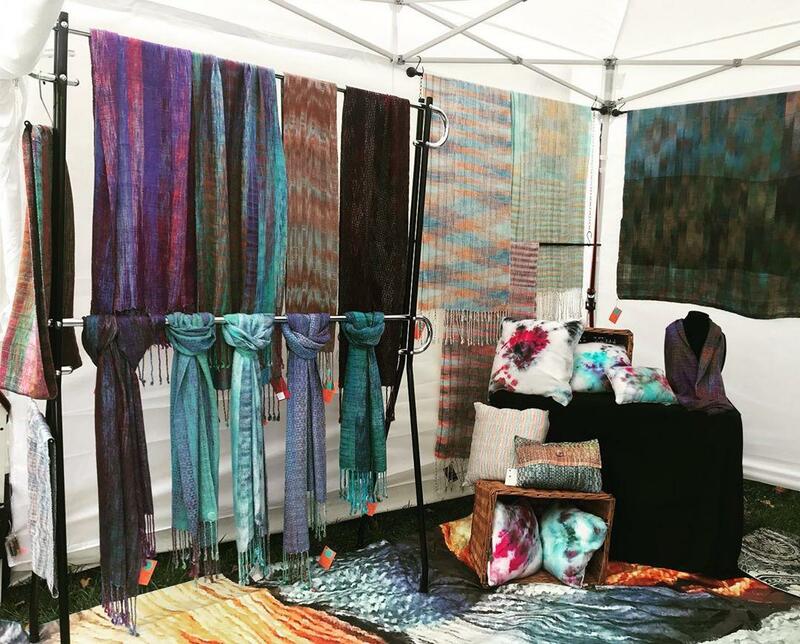 The 15" size is perfect for shawls, towels, runners, and blankets. 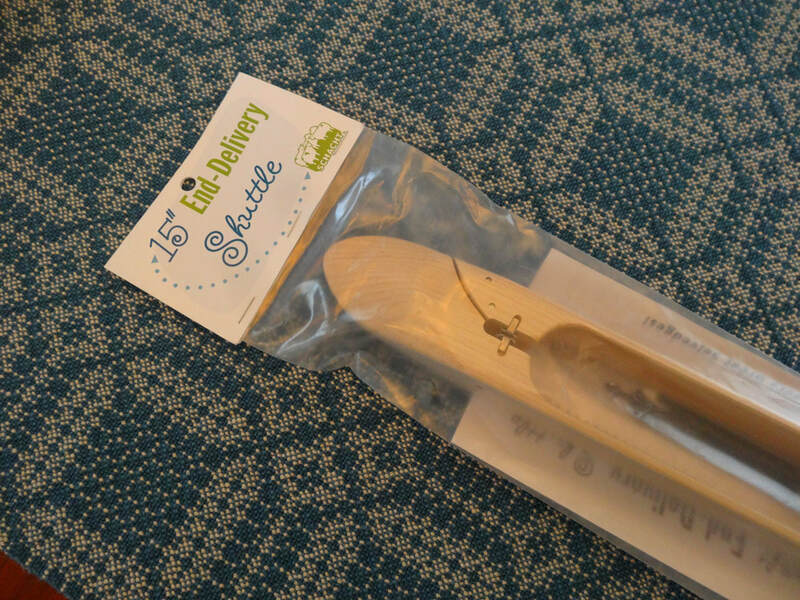 The 12" is perfect for smaller items like scarves. 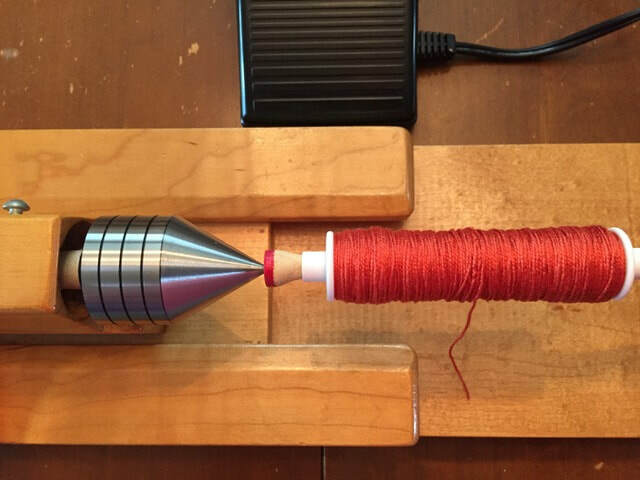 Pirns can be wound with an electric bobbin winder or a manual bobbin winder. 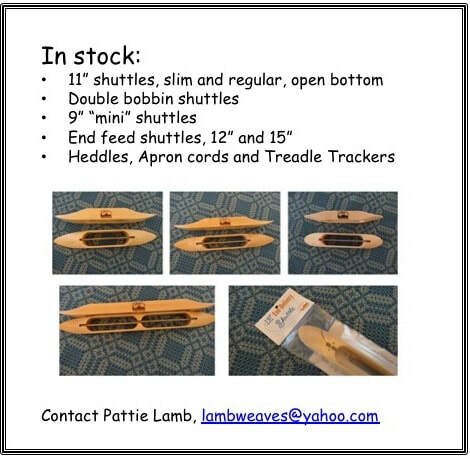 Carrying a small line of ready to purchase weaving equipment including looms (Wolf Pup and Cricket - Rigid Heddle), Warping Boards, Winding Station, Shuttles and Bobbins, bobbin winders etc. She can also order any Schact product and have larger items shipped directly to you! 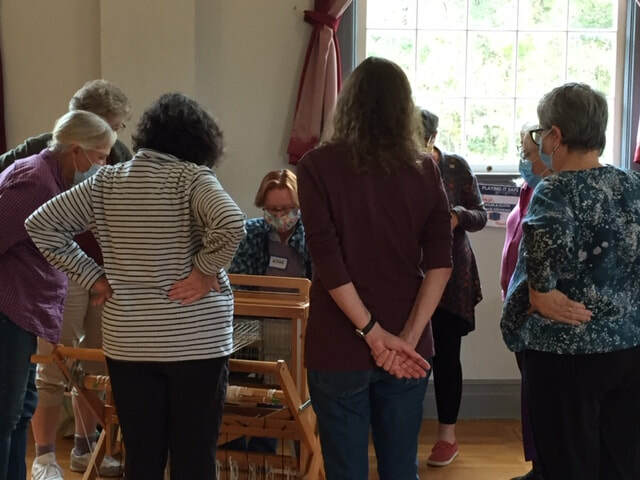 Located within the walls of The Yadkin Valley Fiber Center 129 Church Street Elkin, NC please email with questions or to have items delivered at one of our guild meetings.